I own several rentals in Indianapolis, and I’ve self-managed them for over 24 years. It’s been quite a ride — very eye opening — but I’ve enjoyed it tremendously. At the end of every month, I write a news letter to all of my tenants, and I deliver them to each home, along with pre-stamped, pre-addressed envelopes for their next month of rent. The reasons I do this? I’m able to give them reminders re: some of their lease commitments, like keeping noise (music, voices, TV, children) to a low level so as not to disturb neighbors. I’m eliminating the “no stamp” and “no envelope” excuses for not sending their payment on time. And during cold weather, I can give everyone valuable tips to help them stay warm, keep their pipes from freezing, etc. I got a “no heat” call from a duplex tenant, in the dead of the cold, Indianapolis winter. I called my HVAC guy and had him go check it out. The furnace was older, and I hoped it wouldn’t need replacement. Now, there’s one furnace in that duplex, and a thermostat in one of the units that controls the entire house. My repair man walked into the unit and yes, it was really cold in there. The furnace access was in the other side, so he went to check it out. Amazingly, it was totally warm in there! Whaaatt? There sat the tenant, toasty warm. But when Jim walked into the kitchen, he discovered that the stove top elements AND the oven were turned on “high.” And of course, since it was so hot in there, the thermostat in the dining area wouldn’t kick on. He and I both had a serious talk with the tenant. Not only is that practice dangerous, the furnace wasn’t kicking on at all. There was nothing wrong with the furnace, only something wrong with the actions of my tenant! With those things in mind, if someone moves in and is late with rent, they know we aren’t going to let that slide. Early on, I tended to let things go, and accept late rent with no late fee attached. Tenants caught on to this quickly, of course! Why the urgency to pay on time if there’s no penalty for paying late? I learned the hard way, of course …. Now, I stick by my lease, which demands a 10% fee if I don’t have the rent by the 6th day of the month. If someone has to pay that late fee one time, they make sure it doesn’t happen again. Those fees can be hefty, especially on higher end rentals. Moral of the story? Be kind, but be firm and stick to your lease terms. At the end of the day, it’ll create a calmer environment for you AND your tenants! So, You Want to be a Flipper? Yes, it’s all the rage … reality TV shows like Flip This House, Flip or Flop, and even the one filmed here in Indy, Good Bones … they all make it look so easy, right? And the reality celebs reap incredible profits on all the sales. It’s no wonder I get approached fairly often by new investors who want to be flippers. I mean, what could go wrong???? When you estimate repairs/updates, there are always unplanned expenses and repairs that pop up. You should always pad your repair estimate to cover those unexpected surprises. What if you can’t sell it immediately? What if it sits six months, or even more? You’re still carrying all your holding expenses, i.e. utilities, taxes, insurance, mortgage — slowly draining your eventual profit. In a really tight, strong market, like Indianapolis (and many others), there isn’t a lot of wiggle room between what you can purchase a fixer-upper for, and what you can sell it for on the “flip side.” Bargains have gotten much harder to find. Several of the HGTV celebrities have started programs/seminars you can purchase, where they’ll lend you money, teach you, get you set up, etc. How well do you think they know YOUR market? And many of their programs are 30K+ — crazy! I’m attaching an article that addresses the “business” of flipping and the pitfalls. It’s a good read. My best advice would be to contact an experienced local flipper who might be willing to mentor you if you’re super serious about pursuing this route. 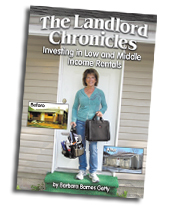 Flipping houses isn’t guaranteed, steady income, and it isn’t for the faint of heart! Is Indy Cool Enough for Amazon? Are you kidding me? How could “IndiaNOplace” be in the running for Amazon’s coveted second national headquarters? How could this former sleepy “Naptown” even be in the conversation? An article appeared in the New York Times recently addressing that very question. Our award-winning airport makes travel easy, and our traffic patterns are ridiculously smooth compared to other 2M+ metropolitan areas. Fed Ex, who already has a major presence here, has just announced a 1.5B expansion over the next seven years. And we continue to attract hundreds of national conventions each year. As a local Realtor/Broker, I get inquires from all over about our city. Our market is strong and very stable, and there’s no end in sight. Thank them for tending to the house and keeping it clean. Show appreciation for the fact they pay the rent in a timely manner — give them a gift card to a local grocery store or other popular venue, i.e. Target or Walmart. When they call with a repair issue, get back with them immediately, not the next day. This shows you care about them and the apartment. When they have an issue, even if it isn’t something within your realm of duty (like “The cable’s acting up” or “Our internet’s down, for some reason”, don’t brush them off. Try to offer some options toward a solution. When you exceed expectations, your tenants appreciate it. They’ll also share praise of you with other friends/family, often sending you other potential great tenants. Remember, your reputation is one of your most prized possessions in this business. Providing clean, updated, well-maintained homes is Step 1. Delighting your great tenants is Step 2. And the result? Happy land lording and a happy bank account, of course! If you’ve found a home that interests you, drive the area at different times of day — morning, mid-day, evening, weekends. That will tell you a lot about the neighborhood activity. If you get the chance, talk with a couple of neighbors. They’re a wealth of information. Check for crime stats in the area by stopping by the local police station, or going to http://www.trulia.com/crime. Check for what amenities are nearby: groceries, schools, parks, restaurants, other shopping, public transportation. Pay attention to how well kept the homes are on that street and nearby. And of course, look at what the home itself offers, in comparison to others. Is there value there? Are prices rising in the area? Whether you’re looking to rent or buy, it behooves you to be in an “up-and-coming” neighborhood as opposed to one that’s on the down side. When I purchase rental properties, I make a point of meeting neighbors, giving them my business card, and letting them know I’m a good landlord. I care about my tenants, my homes and the community as well. The neighbors see that in action as I work to renovate and improve my properties. All is well and good, until a less than stellar tenant enters the scene. Rick and Tammy (names changed to protect the guilty) moved into the house in April. They checked out well — but unfortunately, good jobs and salaries don’t tell the whole story. So when I got a text in mid-December, from the same neighbor, saying there were five policemen in the front yard, along with my tenants, I filed eviction immediately. In this time frame, the number of rental units has soared from 34 million to 43 million, in 2015. By 2025, it’s expected to top 46 million. The largest percent of that growth — 80%! — has come from the conversion of single family homes into rental properties. Demand has grown in all income ranges, but particularly in households earning less than $100,000/year. Because of the rising demand, rents are going up, while incomes are not keeping up. Renters are spending a larger percentage of their take-home pay toward their rent payments than ever before. But even so, we’re expecting continued growth in our rental markets throughout the US. With no end in sight for the continuing demand on rental properties, investors are diversifying their portfolios and putting their monies in real estate. Indianapolis is a very desirable rental market; our economy is growing, yet our prices are reasonable compared to the rest of the country. We have investors from all over the world who’ve decided this is the place to be … especially in the low/middle income markets, there are still great returns to be made. Many employers today turn to Facebook, Instagram. LinkedIn, and Twitter to get the “inside scoop” on applicants. Those social media sites provide a broader view of a person than the bare facts of job history/performance. Property managers also go to those sites to learn more about potential renters. Facebook, for example, can verify some of the info contained on the rental application. These sites also can provide insight into they type of renter the applicant might be: are there pets not reported on the application? Is the person into throwing wild parties? Are there other lifestyle concerns? It’s important to know that if you choose to use these sites to help you in your tenant selection, you must use them equally with all applicants, so that you’re not in violation of Fair Housing laws. And another thought — can you be fair about your opinions after you’ve checked out someone on FB or Instagram? It’s very possible their taste/opinions/political or religious beliefs may be drastically different than yours. That doesn’t mean they wouldn’t be fantastic tenants. You have to remain neutral if you decide to use these extra means of screening. If you can’t, maybe just stick with the written application! I’m pretty open-minded, so I’m going to start using social media as an additional screening tool, if the applicants’ accounts are public. Better screening can help me find better tenants, and I’m all for that!